And Happy we are!!! Girl fun, girl play, girl creativity! We started the morning off with some color theory in understanding color and the color wheel. Terminology of describing color and how we use it for everything in life. “The brain rejects what is not in balance”, but what do we do to balance it? We played with wool, color charts and dyes, first understanding our base color and design on the wool. The pots were boiling, the oven on and everyone was anxious to play. Aprons on, loud chatter, oohs and ahhs and ready to go! We used 3 of the many methods for dying: spot dying in the oven, trans dying in a pan and set in the oven, and stove top in a large kettle. The results were wonderful and like children, they absorbed new and some complex techniques , even while the chatter and laughter were non stop! Their creations of art where hung on the line and modeled for all! Looking forward to see how they use the wool in their hooking! Great day, Holly, Deb, Marlene, Kathy and Ellen! We will dye happy! New dye classes with natural ingredients will follow. 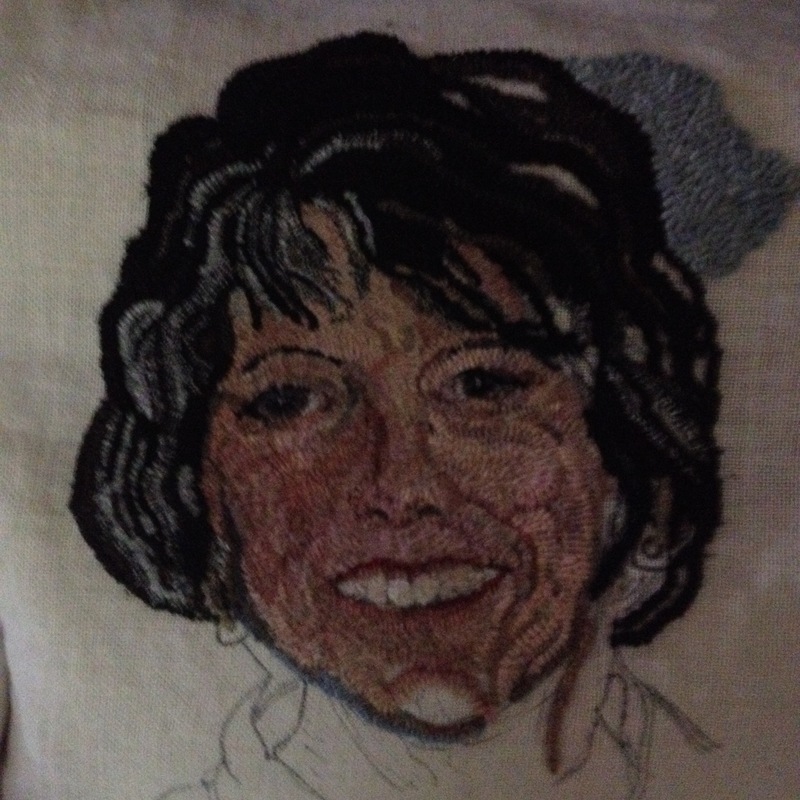 When hooking a portrait you will need more values than you think.Being able to dye your own wool as you need it keeps you moving along without waiting to have it done for you. Dying is an art in itself and the possibilities are endless.A dye pot or two and few simple colors to mix gives you the values you need. You do not need to use flesh tones to do a portrait as long as you can SEE what you are looking at. That is different values and where they are placed. In this self portrait I started with hooking the eyes and found that my eyes were not drawn in the right placement apart from the nose, so lesson number one. Really look at everything to be sure they are placed right. I hooked the lids first and then moved to the iris and then the pupil. If you turn your photo upside down and not concentrate on the full face, you can see the direct spot that you are hooking and is easier to focus the value of the area to be worked. Look where your light source is coming from. In this case the left side of the face and the highest point which is the bridge of the nose would be hooked in lightest values.The cheeks are also a light value but somewhat darker than the bridge of the nose as they are lower and so on. The real key to study and really “see” what you are looking at.Once you train your eye to do this you are on your way to understanding value! 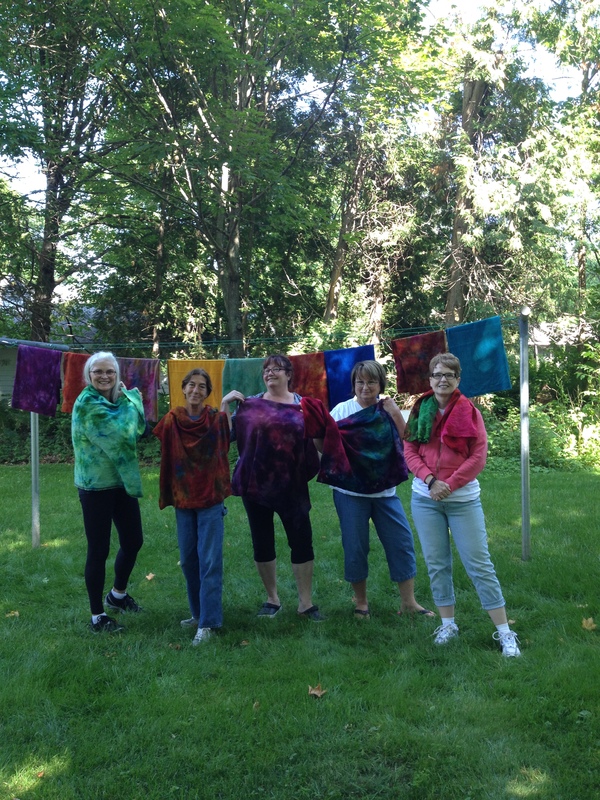 There will be an all day dyeing class at the studio and you will learn 3 methods of dying and you may choose to do one of each or or your favorite. You will go home with 1 1/2 yards of dyed wool from your color choice! Registration is required and limited to 6 people. An additional class can be scheduled with over flow. $75.00 includes instruction, wool and dye.